I buried a friend yesterday – or would have but for the fact that, these days, people are rarely buried. Instead, one attends dreary crematoriums. They don’t have the same feel as a proper church followed by the graveside ceremony. And, despite the care taken to make everything as tasteful and dignified as possible, I hate them. More to the point, I hated the reason for my being there in Darlington crematorium – the untimely death of Peter Troy from a massive heart attack, suffered at the beginning of last month only days before he had been due to chair a Flexcit seminar in the Farmers’ Club in London. The seminar, held on 29 April, had been Peter’s idea. He had arranged it at short notice as a possible way of encouraging potential members of a new group we were in the process of creating, in the hope that they would take to Flexcit, once they knew a little more about it. This had not been the first Flexcit seminar. That had been organised by Peter in Harrogate in June last year, where he is photographed with a very hot North and our co-sponsors. Its purpose was to give me a chance to air an as then incomplete work in front of a live audience, better to gauge my approach and improve the work. A revised and improved version was then aired in Dawlish on 26 September last year. Peter, with customary energy, not only organised it but arranged to have the proceedings filmed. He then produced a superb video which continues to be available online – now with nearly 5,000 views. 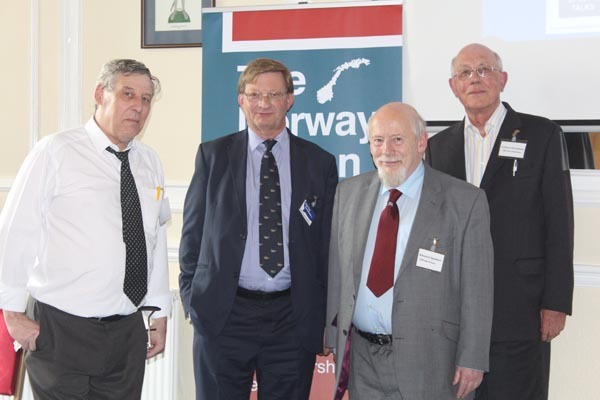 In Peter’s absence in London last moth, the third seminar was chaired by Edward Spalton, current Chairman of the Campaign for an Independent Britain (CIB). Edward was there at the funeral yesterday, to pay his respects. But, as it happened, none of the people we wanted to convince actually deigned to turn up to the seminar, but it was well-attended by an enthusiastic group of supporters. They gave us the confidence to go ahead with the group we were planning, in which Peter had played a crucial part. The group, I can now reveal, is called the Referendum Planning Group (RPG). We plan a formal launch in October, and the current membership includes Edward Spalton, Anthony Scholefield, representing his Futurus think tank (also in the Harrogate photo), Robert Oulds of the Bruges Group, Niall Warry representing The Harrogate Agenda and myself representing EUReferendum.com. However, in this case, the group owes its existence to an original initiative by David Phipps, now Scribblings from Seaham, also from last June. Worried by the fractured nature of the eurosceptic movement, he sought to broker a meeting of all eurosceptic groups. The aim was to help prepare a referendum campaign, should Mr Cameron’s Conservatives come to power (as indeed they did). Despite the invitation being completely open-ended, distressingly few groups responded. Of those that did, some have fallen away, unable to accept a premise that we should coalesce around a single draft plan, and work towards its completion, as part of the basis for an effective campaign. Instead, the dissidents argued that we should form a group with no commitment to any plan and then undertake “prolonged discussions” in an attempt to reach agreement on the way forward. Should we not agree, the idea was then that all the members would promote their own plans, under the single umbrella of the group. It was Peter Troy who took over the organisation of the RPG and did his very best to bring the other groups on board. But it was not to be. As he lay stricken and the seminar went ahead, it became clear to us that, if there was to be an RPG, it would have to start off with its five committed members. Thus, at a recent meeting in London, just before Peter’s untimely demise, we decided to go ahead, using Flexcit as a draft component of our planning. The idea of the group is, as its title indicates, to plan a referendum campaign. It is not intended that it should, in itself, be a campaigning group. We intend it to be more of a facilitator which will help its component members prepare a submission to the Electoral Commission, seeking designation as the lead “no” campaigner. We have no illusions as to the difficulties involved. And, despite the assumptions of other (now multiple) groups that they are the natural heirs to the “no” crown, we will work with anyone who is prepared to put the needs of the campaign first. We are more than happy to add our considerable expertise and skills to the common cause. However, were he still here, Peter himself could affirm that we will not accept a subordinate status, where we are required to fall in with the diktats of any self-appointed London élite, or anyone else, and become their obedient serfs. And nor will we be ignored. The point he made to me so many times was that there are thousands of people who, over the decades, have collectively expended hundred of thousands of hours and untold wealth in the fight for freedom. They have earned the right to be directly involved in the campaign. In memory of Peter Troy, but also in deference to the stalwart men and women of this country who have fought and are fighting so hard, we must resist assumptions that anyone has a God-given right to the leadership role. Nor can we accept that the campaign is the plaything of an as yet unknown multi-millionaire, or even that it is the property of Ukip. To be successful, it must be a people’s campaign, and who takes the lead slot is for the Electoral Commission to decide. We expect the Electoral Commission to recognise that the ordinary people of England (and our colleagues in Scotland, Wales and Northern Ireland) deserve fair and equal participation in the “no” campaign. We will fight alongside anyone in the common cause, but as equals and not subordinates. We’ve had enough subordination from Brussels. With his work on Flexcit and his intense pursuit of a functioning Referendum Planning Group, that aspiration is further on than it might otherwise have been. We will miss Peter’s energy, his dedication and his commitment most dreadfully. But the fight goes on.